Trimming large hedges can be hard work and time consuming but having the right tools for the job makes it much easier. We review 5 of the best long reach hedge trimmers on the market today. With the summer well under way, you’re probably thinking about trimming your hedges. This can be an arduous job without the right equipment, but, as long as you’ve got the tools for it, it can be as easy as pie. But, what do you do when your hedge is so big you can’t reach the top? You certainly can’t leave your hedge with a mohawk – those went out of style decades ago. The answer to your plight is simple – you need a long reach hedge trimmer. These nifty tools will allow you to get to those hard-to-reach places and take care of business without the use of a ladder, which can be hazardous, to say the least; climbing around with a device with sharp cutting teeth doesn’t sound too sensible to us. So a telescopic hedge trimmer is definitely recommended in this situation. And if you’re looking for such a product, we’re here to help you. We’ve prepared five of the best trimmers for you to choose from, as well as a short guide to educate those who don’t know anything about long reach hedge trimmers, and trimmers in particular. Before we move on to our long reach trimmer reviews, let’s start with the basics, and explain what trimmers are and what kinds of trimmers can you get your hands on. Essentially, a long reach trimmer is the same as a regular trimmer, so everything we say about trimmers applies to long reach trimmers as well. The only difference between the two is that the latter ones have a telescopic handle, while the former ones don’t. So, what is a trimmer? A trimmer is a tool that resembles a chainsaw, although it has a longer and a thinner blade with more prominent teeth. Trimmers come in two main types, depending on the type of energy the machine uses. So, you have petrol-powered trimmers and electric trimmers. Electric trimmers are further divided into corded and cordless trimmers. Needless to say, all three have their advantages and disadvantages, and you need to be aware of them before you make your purchase. Starting with petrol trimmers, they’re incredibly high-powered and can cut through very thick branches with ease. This is the main selling point of these machines because their power comes with plenty of disadvantages. For starters, they’re powered by a two-stroke engine, which will require you to put oil in the petrol to make them run properly and smoothly. Petrol engines also require a lot of maintenance, and they’re very dirty. On top of that, petrol powered-trimmers are big, noisy and heavy, making prolonged work a strain on your arms, back and shoulders. 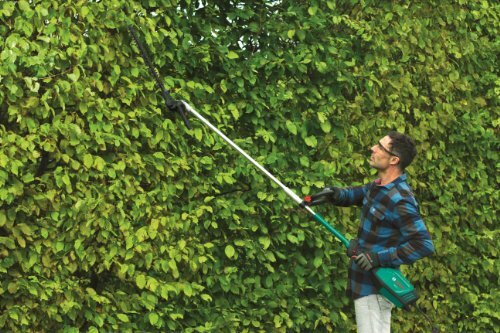 Long reach petrol trimmers usually come with straps to help you manoeuvre them around. However, their power is undeniable, and they’ll cut things electric trimmers cannot. Their counterparts are corded and cordless electric trimmers. Corded electric trimmers have a power cord attached, and require an outlet to run. This makes them less mobile, and you’ll need an extension cord to make full use of them more than six metres from the outlet. However, they’re lighter and much less noisy than petrol trimmers. They aren’t as powerful, but they perform consistently, more consistently than cordless trimmers. If you’re going to use them, you will also need an RCD which will prevent you from getting zapped by electricity in the case you cut the power cord, which is a very real problem with these trimmers. Cordless trimmers draw power from an attached battery. They’re the lightest and the most mobile trimmers, thought what they have in mobility they lack in power. Though there are some powerful models, these are very expensive, and most are still only so-so when it comes to power. They will also require an additional battery if you plan on working for a longer time, or you will need to stop and recharge the existing battery. So, at which point should you use a long reach trimmer? The answer to this question is easy – if your hedge is more than two and a half metres tall, you will probably need a long reach hedge trimmer. As we’ve said, these machines have telescopic poles that will allow you to reach such heights. Note that you can get special ladders with platforms that will help you get up there, but we would still not recommend you go down that path. Buying a long reach device instead is our preferred choice. Which Features Does A Long Reach Trimmer Need To Have? Aside from a telescopic pole, long reach trimmers need to have some other features too. For starters, they need to have a certain blade length. Most trimmers have a blade length of 40 to 50 centimetres, which means that they won’t be able to reach all the way to the centre of the hedge if it’s more than one metre across. Not only that, but if you can’t really see what’s going on up there you can easily catch a branch, so it’s always a good idea to have a trimmer with solid space between its teeth, as then it will be able to cut any branch that fits between them. Long reach hedge trimmers are also usually fitted with movable heads. These heads can assume different angles, up to 90 degrees, allowing you to reach the desired spot on the top of the hedge while standing directly underneath it. Lastly, long reach hedge trimmers also have to be comfortable. Chances are, you’ll be working with them for a long time, so it’s always a good idea to pick a product that has ergonomic grips. Otherwise, if the machine is uncomfortable, it will tire you out quickly. That wraps up our short guide. Now, as promised, we’ll take a look at our list of five of the best long reach hedge trimmers on the market today. Our first product comes from VonHaus. The 20V Cordless Extension Pole Hedge Trimmer is one of the most affordable products on the market, but one that still boasts considerable power. This is a battery-operated trimmer, which means it’s pretty light and pretty manoeuvrable. Indeed, the trimmer weighs only 6 kilograms. The VonHaus boasts a shorter blade, measuring 41 centimetres. 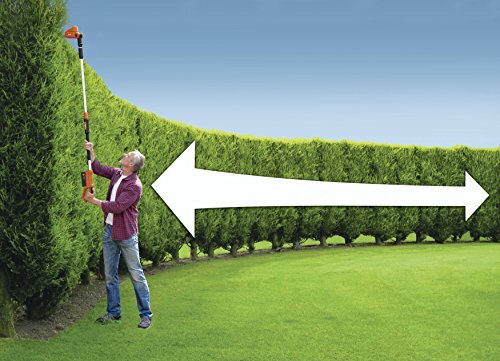 As we’ve said in the guide, this blade won’t reach the centre of a 1 metre wide hedge so if your hedges are wider than this then this isn’t the trimmer for you. The trimmer boasts a 15 mm space between its teeth, so it can cut a branch that thick. With that being said, it’s best you don’t use the VonHaus on overly thick and strong hedges. The product’s pole extends to 2.65 metres, allowing you to reach more difficult places with it. The trimmer’s head can be locked into 6 positions, and it can also rotate so you can get the angle you want during cutting. As the title says, the product features a 20V battery. This will allow you to cut for about an hour without stopping. The machine can reach a maximum of 1,300 rpm, which is pretty good but still not enough to tackle stronger hedges, as we’ve already said. One of the best things about this hedge trimmer is that it has a Dead Man’s trigger. This is a safety trigger, one that prevents you from accidentally activating the machine. The trigger is two-stage, and very useful when you’re operating a machine this long. To further the safety of operation of this machine, the VonHaus comes complete with a shoulder strap that will secure the trimmer and allow for better movement. The machine also comes with a blade cover that will keep the teeth safe and sharp for longer and a battery charger. The VonHaus will cost you around about £80, which is a very good deal, considering what you’re getting. On top of that, the product is covered by a 2-year warranty against all defects, so, if the trimmer suddenly dies on you, you will be able to replace the part or the entire device with a new one. Lacks a little in the power department. So, what do you get with the eSkde? In this pack, you’ll get one telescopic pole and two heads. Both heads are adjustable, of course, and you’ll be able to adjust the angle as you wish when cutting. Being a corded machine, you will require an outlet to make use of it. The product features a 10-metre cable that you can use without an extension cord. One of the most impressive things about this product is how long can its pole extend. The VonHaus can extend to an impressive 2.65 metres, but this one beats that length by 15 centimetres, reaching 2.8 metres in length. This allows you to reach even higher places with the eSkde. This trimmer is also quite powerful, capable of running the blades at 1,600 rpm flat, which is 300 rpm more than the VonHaus. This is all thanks to the product’s 600 W electric motor. However, this motor is the pruner’s motor, and the trimmer is powered by a 450 W motor, making the actual trimmer about as powerful as the VonHaus. The only difference between the two is that the eSkde has a 16 mm gap between its teeth, which allows it to cut a thicker branch. In terms of price, the eSkde is, as we said, a slightly more expensive item. If you choose to buy it, it will set you back around £100. However, considering it’s got two heads including the pruner, this price isn’t unreasonable. 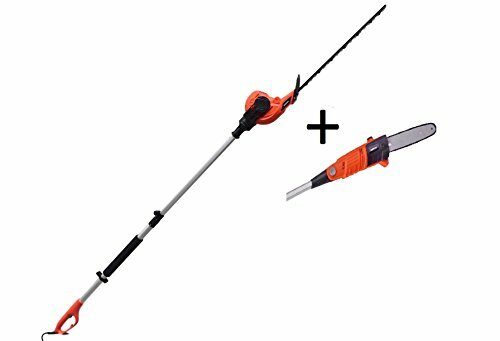 Two heads – pruner and trimmer. Can cut a 16 mm branch. Not so powerful trimmer motor. Limited cable reach (10 m cable). Next up is the Ryobi RPT4545M trimmer. This is a very interesting hedge trimmer because of how its pole has been constructed and how it operates. It’s also one of the better trimmers for thicker hedges. With that being said, it’s not that it’s more powerful than the other trimmers we’ve presented so far, but that it has a better cutting capacity. Starting with the blade, the product has excellent reach. The blade is 45 cm long, so you can reach a bit further than the VonHaus. 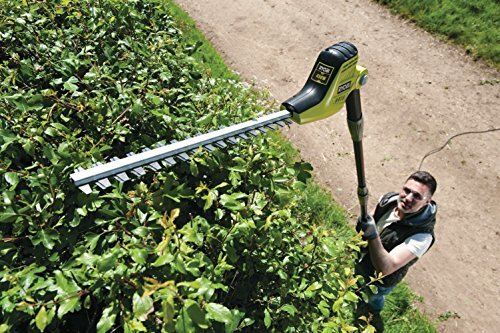 It still fails to reach the centre of a 1-metre wide hedge, but it is on the upper end of the scale for trimmers as far as blade length is concerned. This is a corded device so you may, as usual, need to use an extension cord if you wish to get around to the hedges farthest away in your yard. The trimmer is powered by a 450 W motor, the same as we’ve seen with the last two products. However, as we’ve said, this one boasts a much better cutting capacity, with the teeth standing 20 mm apart. 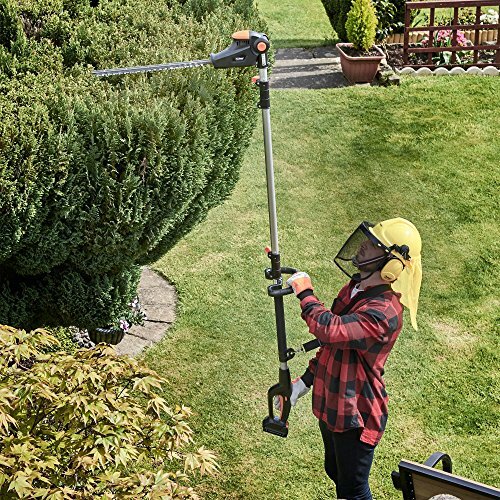 This allows the device to tackle really tough hedges – a definite plus in our book. Now, the thing that makes this product interesting is its pole. This can extend to 2.7 metres, which is good and enables you to reach the highest places with ease. But, there’s more. This trimmer has a 3-part pole, with three separate sections. These sections allow you to adjust the trimmer length with more precision, or to pull one or two sections out, which ultimately allows you to use the long-reach trimmer like a normal trimmer. The head is, of course, adjustable, and it can move 135 degrees all around. The entire trimmer is only 4.1 kg, so it’s pretty light and manoeuvrable. The safety buttons are all close together, so it’s much easier to reach them when you need them. Finally, the product has a very ergonomic handle that will allow you to work with the trimmer for longer without getting tired. Limited range due to power cable. Our penultimate product comes from Flymo. Flymo has been around for 50 years, and, during that time, they’ve developed a good feel for what the customers want. And, what they want is the SabreCut XT trimmer – one of the best telescopic pole trimmers with the longest pole. Not only that, but this product is cordless and lightweight too, allowing for more manoeuvrability and less strain when you work. The trimmer features a solidly long 42 cm blade with an also solid 16 mm tooth gap. This, combined with a 450 W motor allows the device to tackle some thicker branches without losing too much power. The blade is twin action, meaning it has two sets of teeth, allowing the product to cut thicker branches, but also give your hedge a smoother finish. The trimmer features an 18 V battery, which can run for 50 minutes, making this particular trimmer perfectly suited for smaller gardens. The batteries are interchangeable too, so it’s a good idea to get another battery with the one that comes with the product. This will give you almost two hours of runtime, which is pretty impressive. The only bad thing about the battery is that it takes three hours to charge, giving the trimmer a very negative charge-to-runtime ratio. Now, for the pole. So far, the record’s been 2.8 metres. However, the SabreCut beats that record by exactly 20 cm. The 3 metres long pole will allow you to cut anywhere and everywhere without much hassle. The head, of course, moves allowing you to better position it for cutting. Not only that, but the head has been optimised to allow ground cover cutting so you don’t have to bend to cut. Combined with an ergonomic handle and its light weight, you get a very easy to handle trimmer. However, the product’s very long pole makes it somewhat less manoeuvrable than the other products, and you will lose some of the accuracy when cutting with it. This trimmer falls into the category of slightly more expensive products. Optimised head for ground cover cutting. Long pole makes it less manoeuvrable. Not so good charge-to-runtime ratio. Last but not least is the Bosch AMW 10 HS Pole Hedge Cutter. Anyone who’s ever been looking for power tools has certainly heard about Bosch. This company makes the best and the meanest devices, so you can be sure they’ve got something awesome in their stock for this list. And, indeed, the AMW 10 HS is, by far, the best and the most powerful hedge trimmer on our list. So, buckle up and prepared to be blown away by this Bosch marvel. As usual, we start by describing the blade. This device has a 43 cm blade with a 15 mm tooth gap. This is not a bad length, but not the best. The tooth gap could have been larger, as the product gets outclassed by less expensive products in this aspect. However, when it comes to power, no other product on this list comes even close to AMW. For all intents and purposes, this is a heavy-duty trimmer with an incredibly powerful electric motor. This motor can dish out a staggering 1,000 W of power, allowing the product to be even on a par with some mid-range petrol trimmers. Such a big motor requires quite a bit of energy, which is why the AMW is a corded device. This makes the product a little limited when it comes to range, but use an extension cord, and no branch will be able to withstand the AMW’s onslaught. Not only that, but this product is also multi-functional. The AMW is, like the eSkde, a 2-in-1 trimmer and pruner. Changing heads is incredibly easy, and you can do it without any tools. The heads are, of course, adjustable, so you can personalise the trimmer and adapt it better to your own garden. However, bear in mind that this is a slightly heavier product. The trimmer weighs a bit more than 9 kg, but does come with a shoulder strap, making the trimmer’s weight more manageable. Easily attached and detached heads. The trimmer is heavy and less manageable. Smaller cutting capacity than some trimmers. More limited range due to being corded. And, with that, we’ve completed our reviews of five of the best long reach hedge trimmers on the market. As you’ve seen, we decided not to include petrol trimmers, mostly because they should have a list of their own, and because they’re not really comparable to electric trimmers in terms of power and weight. In any case, we leave you with five excellent corded and cordless trimmers that will, first of all, not break your bank, and, second of all, not break your back. Enjoy your trimming!